Ernest IV was more ready than ever for combine harvesters, tractors, and semi trucks. 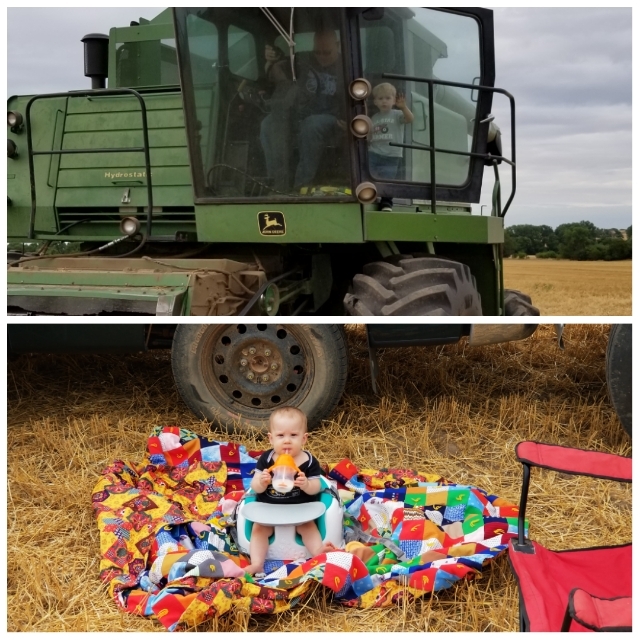 He's been playing wheat harvest for the last year and for a week he was able to live out his dreams of hulking machinery, meals in the field, and trips to the granaries. I'm sure he was sorely disappointed that we didn't get stuck in the mud. Mira could care less about harvest. The painting received it's first display to the public in Salina, KS. More than a few people were disappointed it wasn't available for sale yet. The good news is it will be taking part in the Oil Painting National Exhibition at Mark Arts in Wichita, KS. You won't want to miss the July 20th opening of the show. If you can't wait until then, it's premiering at the grand opening of Mud Haus this Friday at 5pm. It's an amazing new show room for 2DOGS Concrete located at 922 E Douglas in Wichita. You'll be dumbstruck by what these guys can do with concrete. Also, I'm more than pleased to be showing there alongside Craig Campbell who is a masterful realist sculptor in Wichita. See his amazing work here. Thank you to my patrons who are making amazing things happen each month. I'm dedicating the custom frame being built for "Hope" to you all. It's going to make the piece an absolute stunner because of your pledges. If you haven't yet made a pledge, simply go here to pledge and watch what gets made when I have your backing. You have a unique opportunity to let these paintings soar.